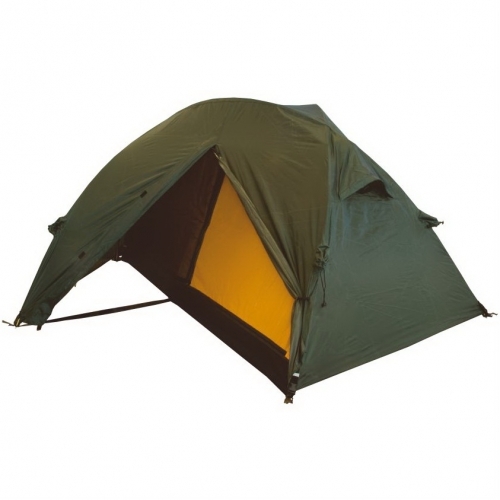 The two-entrances double-sheet dome tent with a pentagonal ground-plan of the floor. It is suitable for all kind of hiking & outdoor activities, even in the most difficult conditions thanks to the 3 poles self-supporting structure and 3 crossings. The tent can also be used in winter (for this purpose, we recommend sewing "snow flaps" at the edge of the flysheet). The inner tent is sewn with the floor and is hung on the frame poles with help of hooks and ropes. The vents on the inner tent are with the shrink sleeves (with dense mosquito-net). Also the airy&dense mosquito-net in entrances enable ventilation & protection against small insects. The flysheet is put over the frame and anchored with help of buckles at the poles ends. In front of the larger inner entrance the flysheet forms one large vestibule which can be used both for storage of an equipment and for cooking (with careful caution). The tent is possible to anchor with numerous anchorage points of flysheet or through small sleeves directly on the poles with help the attached cords and pegs, or bigger stones, etc.. There are two air vents at the top of flysheet. The space (about 5 - 6 cm) between the inner and outer walls improves thermal comfort & ventilation and reduces a condensation of the tent. This space can be edited with releasing or tightening of the inner tent tensions guy lines. Features: 1. 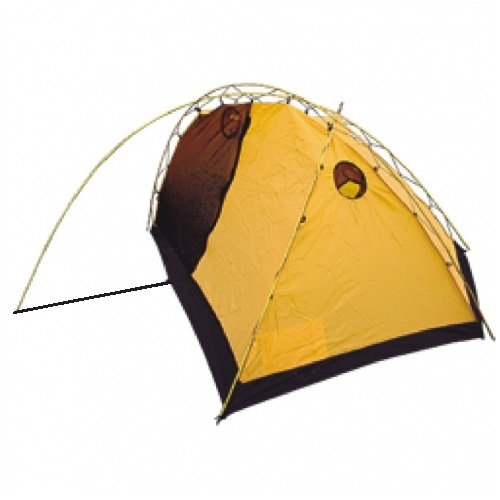 Anchoring over the sleeves at the edges directly to the poles increases tent stability. 2. Fixed and fast anchoring of the lower corners with ITW buckles, backed by the elastic webbings with triangles. 3. Well-proven, covered ventilations with the tightening sleeves, with internal control. 4. Tightening sleeve ventilations of the inner tent. 5. At the bottom corner of the flysheet and at the opposite corner of the floor there are the reflective strips to facilitate set up of the tent, especially at night. 6. Well-tried hanging of the inner tent with ropes and hooks makes set up easier. 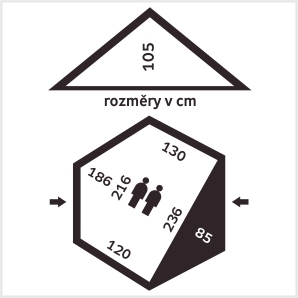 In this case, the total weight of the tent without the collar is 3,2 kg. Alu pole Ø 8,5 mm: 3 pcs.